Did IRAS Find Planet "X" in 1983 ? 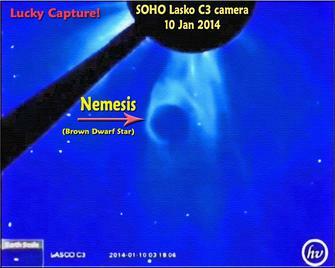 NASA photo of "Planet X"
Nibiru - a planet circling "Nemesis". The gist of it is this: Earth's Sun is known to have a binary "twin" which is a brown dwarf. Is that Brown Dwarf Twin carrying with it another solar system (like our own) that has planets which can swing into our Solar System's orbit from time to time? 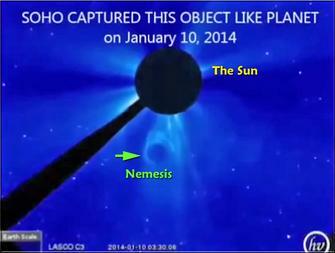 Is "Nemesis", Hercolobos, or "Nibiru" a NEO (Near Earth Object) ... a comet fragment from the Oort Cloud, or a roving planetoid, whose orbit takes it into our Solar System from time to time? Gil Broussard's "Very Bad Day"
The Nebra Disk & Joshua's Long Day: A Past Pole Shift? "A heavenly body possibly as large as the giant Jupiter and possibly so close to Earth that it would be part of this solar system has been found in the direction of the constellation ORION, by an orbiting telescope (IRAS)..So mysterious is this object that astronomers do not know if it is a planet, a giant comet, or a nearby proto-star (dwarf star) that never got hot enough (or big enough) to become a star." "All I can tell you is that we don't know what it is," said Gerry Neugebauer, Chief IRAS scientist. The most fascinating explanation of this mystery body; which...casts no (visible) light and has never before been seen by optical telescopes on the Earth or in space, is that it is a giant gaseous planet, as large (or larger) than Jupiter. "If it is really that close, it would be part of our solar system." "If it is that close, I don't know how the world's planetary scientists would even begin to classify it." "The object (has been spotted) on the western edge of the constellation of Orion...and there has been some speculation that it might be moving toward Earth!" The mystery body was seen twice by the infrared satellite as it scanned the northern sky from last January to November, when the satellite ran out of the supercold helium that allowed its telescope to see the coldest bodies in the heavens. This suggests it's not a comet because a comet would not be as large as the one we've observed and a comet would probably have moved," Houck said. "A planet may have moved if it were as close as 50 trillion miles but it could still be a more distant planet and not have moved in six months time." When IRAS scientists first saw the mystery body and calculated that it could be as close as 50 trillion miles, there was some speculation that it might be moving toward Earth. "It's not incoming mail," Cal Tech's Neugebauer said. "I want to douse that idea with as much cold water as I can." Then, what is it? What if it is as large as Jupiter and so close to the sun it would be part of the solar system? Conceivably, it could be the 10th planet astronomers have searched for in vain. It also might be a Jupiter-like star that started out to become a star eons ago but never got hot enough like the sun to become a star. While they cannot disprove that notion, Neugebauer and Houck are so bedeviled by it that they do not want to accept it. Neugebauer and Houck "hope" the mystery body is a distant galaxy either so young that its stars have not begun to shine or so surrounded by dust that its starlight cannot penetrate the shroud. "I believe it's one of these dark, young galaxies that we have never been able to observe before," Neugebauer said. "If it is, then it is a major step forward in our understanding of the size of the universe, how the universe formed and how it continues to form as time goes on. "The next step in pinpointing what the mystery body is, Neuegebauer said, is to search for it with the world's largest optical telescopes. Already, the 100-inch diameter telescope at Cerro del Tololo in Chile has begun its search and the 200-inch telescope at Palomar Mountain in California has earmarked several nights next year to look for it. If the body is close enough and emits even a hint of light, the Palomar telescope should find it since the infrared satellite has pinpointed its position. yesterday. The correct figure is 50 billion miles. JPL's John Anderson's article on Planet X: this is a hardcover bound encyclopedia of Science Yearbook ... it wasn't presented as "conspiracy theory"
The Chief Astronomer at the USNO didn't think Nibiru was a "conspiracy theory"
He presented his findings in "The Astronomical Journal"
In that documentary, Harrington displayed Planet X's orbital diagram which he labeled, "Nibiru"
"1991" - Harrington ordered a special telescope for a sky survey to search for Planet X; based on Harrington's calculations. 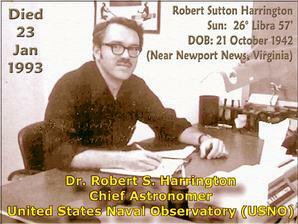 The survey was conducted in 1991, at the Black Birch Observatory, in New Zealand. 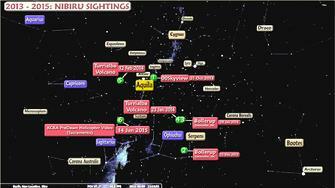 The survey's findings, films & report were delivered to NASA and were never heard from again. "1993" - Neither was Harrington. He died 23 Jan 1993; from sudden onset of an especially agressive form of esophageal cancer. Not every pass of Planet X causes Earth a big problem. Only if it crosses Earth's orbit when it and the Earth are on the same side of the Sun ... as Ferrada believes will happen this time around. On its next pass, it will hit 3 main areas the hardest (with "volcanic earthquakes"
Your Government Dollars at work! Where Things Stand So Far ...? At this time, many people link the ending of the Mayan Calendar with the possible return of the planet "Nibiru" made popular by Zecharia Sitchin's many works dealing with ancient Sumerian culture; its writings and artifacts ... which he presented to the public beginning with his ground breaking book: The 12th Planet. 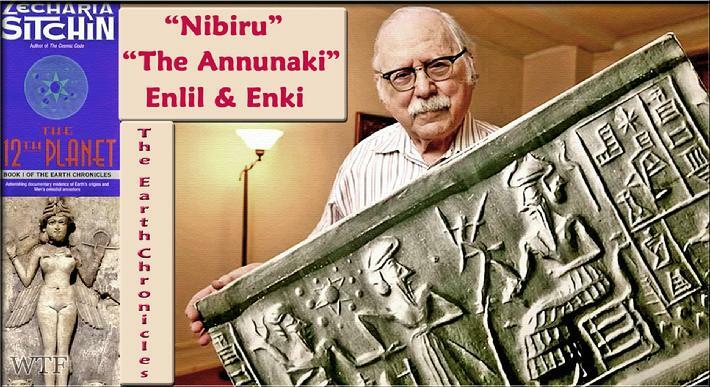 But, in his own book End of Days, Mr. Sitchin says Nibiru is not due to return in our lifetime. Still, so many prophecies; Mayan, Aztec, Hebrew, American Indian, all seem to believe that a time of "prophecy" could actually be coming to fruition in or around 2012. The key here is the Year of 2012 marks the beginning ot the period of time when things go downhill in the world ... a catastrophe occurs and mankind starts all over again. At some point, result in a great alignment or Celestial "Perfect Storm" wherein another planetary body (which could be Planet "X", Niburu, or a Brown Dwarf star) follows an ancient orbit which takes it in a loop around our sun... and a "fly-by" past our Solar System and our own Planet Earth...at which point ... all hell breaks loose in our neck of the Solar System. It is thought that this event is cyclic and occurs every 11½ thousand years or so. 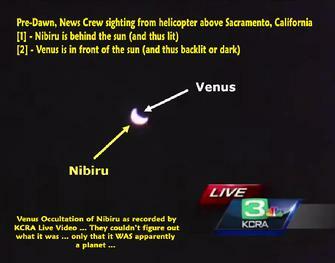 Nibiru has a 3600 year elliptical orbit. 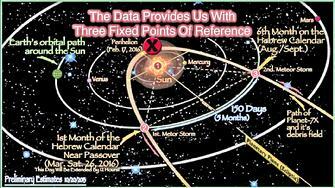 Not every pass of Planet "X" or Nibiru causes havoc as it depends upon the earth's position in relation to Nibiru and our Sun. 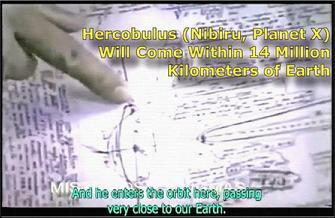 It is also believed that the Mysterious Planet "X" makes two passes at Earth. One on the trek inbound around our Sun and one on the trek outbound back whence it came. On the "inbound trek it appears as the Hopi's "blue Kachina" ... on the outbound trek ... as the Hopi's "red Kachina". This Planet "X" is said to have enough internal heat to allow it to support life in its strange orbit. Others maintain it is a planetary body and not a planet...so it does not have life, only a dangerous orbit. OR: It is a brown dwarf star (our sun's binary twin) and that only one of its planets actually interacts with our solar system. This planetary body is said to appear as a red glowing light in the sky. It approaches the earth from our southern hemisphere so it can only be spotted from Antarctica. When the time draws near for its Return, the Solar System Heats Up, Earthquakes and Volcanoes increase and the possibility of a Pole Shift (magnetic or physical) occurs. With a pole shift, even only a magnetic reversal, the weather is going to be disrupted to say the least. Hurricanes, floods, tidal waves, Tornadoes, Noah comes by in the Ark and says "Howdy" ... you get the picture. Then there are the issues of solar radiation, the stability of the ionosphere, there is a veritable laundry list of domino effects. But the severity of the effects varies with each passing as the planets are never exactly in the same place each time. The Hopi say it will be necessary to go underground for a bit until it all settles down. They may know what they are talking about. They have legends that talk about how they survived the last Fly-By. Some say that over the millennia, some earlier species on earth had decided: "What the heck", let's just stay underground; or, we'll just have to do it all over again in another 11½ thousand years!" Dr. Robert Schoch thinks something happened & civilization had to start all over again... 11,715 years ago. Jaysen Rand's premise is that the Earth's Axis has already tilted & is continuing to do so; because of the North Pole's melting glaciers. Rand maintains that the weight of the North Pole's Ice is no longer there. Thus, the tilt of the Earth is being pulled toward the weight of its Equator causing a shift to one side. This new shift will result in what we now regard as our geographic North Pole ... beginning to lean toward what is now our geographic Equator. Weather patterns as understood in the past ... will become a "Thing of the Past". Weather patterns will become "wild, wooly, & unpredictable". According to Rand, 2 of the most significant axial shifts occurred between Dec 04, 2006 and Dec. 06, 2006. This would be a 2000 mile shift which would not be felt as the Earth rotates 25,000 miles a day at roughly 1038 MPH. The Star charts would show a change of only inches difference in the stars between the latitudes of North & South Dakota and Mexico. There would be a roughly 20�-30� increase in temperatures .,. reported as "heat waves" as the middle of the United States would have more of a tropical climate in the Summertime. The Wintertime would be colder with more ice storms as the tilt of that part of the Earth would be closer to the Sun in the Summer and Further away from the Sun in the Winter. THE REASON? "The rapid formations of "geomagnetic storms" emanating from the boundaries of the arican tectonic Plate that due to their intensity have caused the loss of 2 major passenger aircraft during the past month leaving nearly 300 men, women, & children dead". - Yemeni flight # 626; which went down on 30 June 2009 at: 11� S 18' 59.34" / 49� E 19' 37.15"
The "warning coordinates" are derived from the area surounding the african Tectonic Plate. This is the same area where Nature News Service reported that a new ocean is forming in the Afar Depression of Ethiopia. Here the East African Rift (southern tip of Red Sea thru Mozambique) is experiencing Lava erupting from below and pushing apart the Earth. Researchers were able to watch the rift spread as they were standing at its rim. Western scientists say it will take millions of years. Russian scientists say that the current Solar Minimum (cycle 24 has just begun but so far remains quiet) is an indicator of the forces responsible. Russian scientists also cite the Martian Polar caps melting, and the warming of Neptune's Moon Triton & the planet Pluto. ATLANTIS RETURNS? Some Russian scientists also think that is the african Tectonic Plate is affected by a "Planet X" arrival; then its gravitational imipact could result in the African Plate going under the waves of the ocean and.... Atlantis or Lemuria just might make a comeback. As of: 01-30-2010: Yellowstone's Caldera has had earthquake swarms upward of 1500 in 11 days. The indications are that these quakes are the result of tectonic movement and not lava from the magma chamber of the Caldera. The odd thing is; since Jan. 22nd, 2010, when plotted for depth ... the quakes seem to be going deeper into the earth ... headed down and not up! They seem to be settling in at a depth between about 10 to 10 1/2 km. According to the Nebra Disk, the Earth was once tilted 26 degrees more to the south than it is today. Google lifts black-out on winged disk object - 10� Gemini 41' 24" "JUST F Y I" -  - - Will Planet X be visible July thru December of 2015? - - Planet X visible from Earth on: 07 November 2015? - - "Fit Hits The Shan" on 06 December 2015?